Making pancakes very often in America offered for Breakfast. It is a cross between our pancakes and fritters. But in fact it is the large fluffy pancakes. In this case, in the dough are added ripe bananas. - 1/4 teaspoon of salt. Sift the flour into a deep bowl, add sugar, baking powder, salt, mix thoroughly. Mix one egg with milk, vegetable oil. Ripe banana peel, mash with a fork, send in the egg-milk mixture, stir. Connect the flour mixture with the banana mix. Don't worry that the dough is not uniform - as it should be, it will not affect the taste of the banana pancakes. RUB the pan with oil, preheat it over medium heat. Pour the batter into the pan at the rate of about 3 tablespoons of banana dough for 1 pancake. Bake pancake on one side until they are browned, then flip, bake the second. 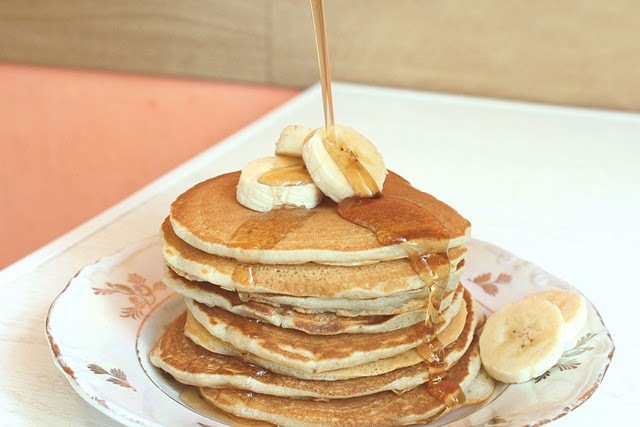 Put the finished pancake with a banana on a plate, in the same pan pour the next portion of the test. So use up all the dough, of a specified number of turn out about 12 pancakes. Serve banana pancakes for Breakfast hot. Top can pour any sweet syrup, serve them with jam, condensed milk, honey or berry sauce. Can additionally decorate them with slices of fresh banana. In the first half of the day you can eat whatever you want and it will not reflected in the figure is known to all. 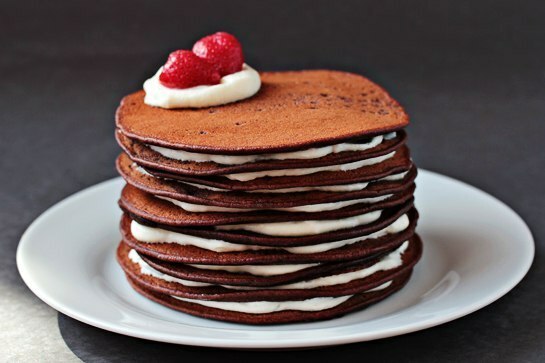 That's why Breakfast can be delicious and sweet, like these magic pancakes. Milk slightly warmed in the microwave. Then break in the eggs, and stir well with a whisk. Add sugar and cocoa, also mix well. In the milk mixture and sift the flour and baking powder, mix until smooth. The batter should flow off a spoon. In a hot pan pour a drop of oil and spread with a silicone brush. In the center of the pan put 3 tablespoons of dough, one pancake in diameter should be about 10 centimeters. Bake for 1-2 minutes on each side. Thanks to the baking powder they quickly rise and become fluffy. Fold the pile on the cooked pancake. Do some cooking cream. Cream beat with blender until thick. Special whipping cream are fat more than 30%, they very quickly become the consistency of ice cream. To the cream add the mascarpone cheese, a pack of cheese and sugar. All carefully whisk until smooth. Apples, peel and seeds, cut into slices. In a small pan put the apples, 2 tablespoons sugar and 3-4 teaspoons of water. All together put on the fire and constantly stir until then, until the apples are not caramelizada. Put on plate 3-4 pancake stack, each layer of fluff cottage cheese cream and the last layer spread the caramelized apples. Delicious Breakfast is ready!